With the availability of technology in today’s world, it’s a lot easier to become parents. There are a lot of gadgets, appliances and even phone apps to help you raise your newborn. Here are some of them. It’s true that your little bundle of joy elicits a lot of smiles from you and your family but when your baby starts crying nonstop, your nerves just get the best of you. Most of the time, the family gets exhausted from taking turns to take care of the baby and from lack of sleep. The Baby Shusher app was developed by parents who know exactly what you’re going through. The Baby Shusher uses an ancient technique that is both doctor-tested and approved to help soothe your baby. This app has been researched and tested with real moms and babies for two years. How does it work? It gives out a rhythmic “shush” that is similar to those that he hears when he was still in the womb. It has been proven that this is more effective than lullabies or white noise. The natural “shush” engages the baby’s innate calming reflex. You can set the timer from 15 minutes to 8 hours to “shush” your baby. This app also features a Sound Equalizer. 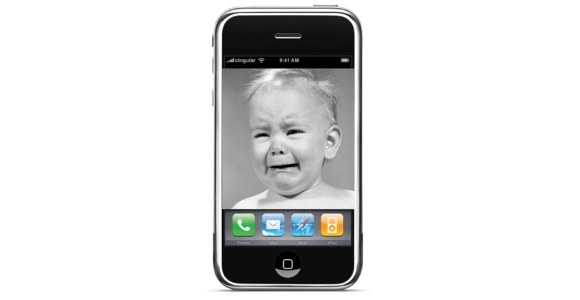 The app listens to your baby every 3 minutes and automatically adjusts the volume to your baby’s cry volume. If your baby is wailing, the shushing gets louder. If your baby settles down, the shushing is reduced to a background sound. If you feel that your own shushing voice is more effective, you can record your own personalized shush as many as you want. What’s great about this app is you can work in your other apps while still using the shusher. When you buy the Baby Shusher, you support World Vision. 10% of all profits go toward babies in need around the world. There are so many things that you need to keep track of when you’re a new mom. The Baby Tracker: Nursing app will help you keep track of your breastfeeding. You don’t need a pen and paper or a stop watch to record your nursing sessions. This app also eliminates the need for bra pins, ribbons and bracelets. You can record your nursing session with just a few taps. You can record the length and the side you nursed on with its very own timer. The timer automatically shuts off at 59:59 in case you forget to turn it off. All your nursing history is permanently stored for future reference. You can also see your daily logs. You don’t have to remember these things. Your iPhone will remember them for you. If you’re not breastfeeding, you can also record bottle sessions and indicate whether you used your own milk or a formula and how many oz/ml you used. The last feeding time is always displayed so you are reminded when the next feeding should be. If you have twins or triplets, no problem! This app supports up to 6 babies and you can customize each one with names. Because everything is in your phone, you can easily show your doctor all your nursing sessions. You also have the option of exporting the data to a spreadsheet. Why should moms do all the work? The problem with dads is, they don’t want to read a book or do some research about taking care of their newborn. This app has been developed to teach dad the things he must know to take care of his new baby. This app features humorous videos and interactive sessions that dads can learn from. The best thing is they’re just long enough to engage the new dad. Daddy won’t get bored with this app. The chapters are divided into eight and use time-tested methods to guide a new father through the parenting process. Some things that he will learn are how to hold, feed and bathe a baby. He will also learn how to change a diaper and put the baby to sleep. It also includes lessons on how to keep the baby healthy and some important infant first aid lessons. This app answers a new dad’s frequently asked questions. Having a newborn can be a blessing but it can also tire you out. Ask for help when you need it and make sure to take advantage of the technology available to you. This article was brought to you by The Kids Window, the comprehensive online kids store including a wide range of Clothes for New Borns.